In my quest to eat clean and losing the African returnee 7 kg, I am reintroducing mid-afternoon healthy snacking into my Ghanaian diet. This is my danger zone where I reach for high fat, sugary items (plantain chips, meat pies, etc) to stave off sleepiness. Counterproductive I know! It’s clear that I need to explore alternative options. The first snack I attempted to make was a baba ganoush dip which I could eat with fresh vegetables. Aubergines are one of the most widely available, locally grown vegetables in Accra, and a excellent source of B vitamins, potassium and dietary fibre. I buy them from the roadside, as they seem to be fresher than the ones available at the major supermarkets. Baba ganoush is a Middle Eastern dip. My version is low calorie (only 47 calories per serving) due to the substantially lower olive oil content than traditional recipes. I add no olive oil to the recipe, and use a whole homemade cashew nut butter rather than tahini, usually made with a generous helping of olive oil. 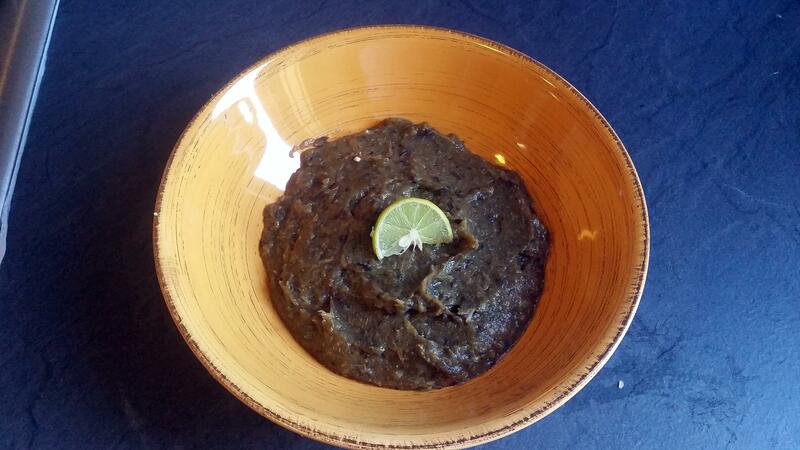 The addition of green peppers provide a thicker consistency than aubergine only baba ganoush. The latter can be a tad sloppy. Wash the vegetables by submerging them in a solution of iodine (sold by Koala (Airport Residential)) and spirit vinegar (available in all major Accra supermarkets) for 5 minutes. Next, scrub the vegetables ferociously under running water using a scourer or brush. Show no mercy to the microbes, bacteria and soil that are often present on the surfaces of fresh produce! My kitchen doesn’t have an oven. The tenants joke that our landlord, who has a reputation of being cheap, side-stepped this (amongst other things in our apartment) to save costs. 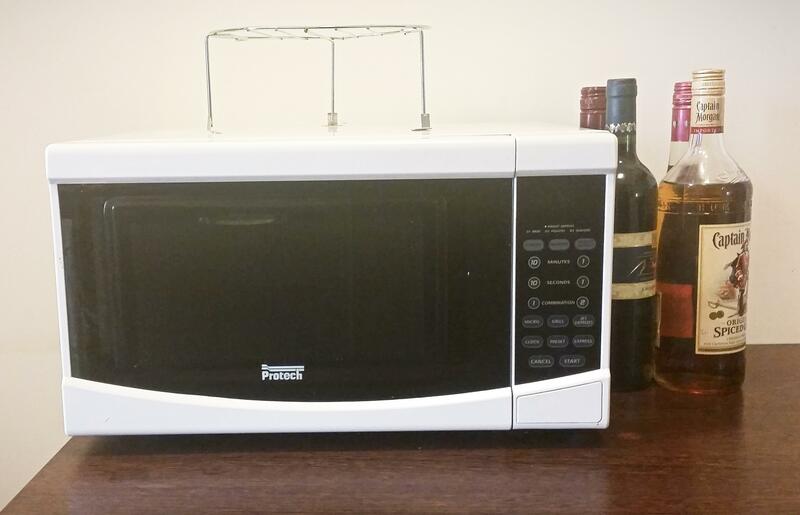 Such a shame, but it has forced me to find creative ways to use the microwave to make “oven baked” food. Luckily, our microwave also has a grill setting, so I grilled the aubergine and peppers for 15 minutes, and the garlic cloves for 5 minutes. Place the grilled vegetables and the remainder of the ingredients in the blender. I used my Blendtec Total Blender in the “Dips, sauces and spreads” setting. 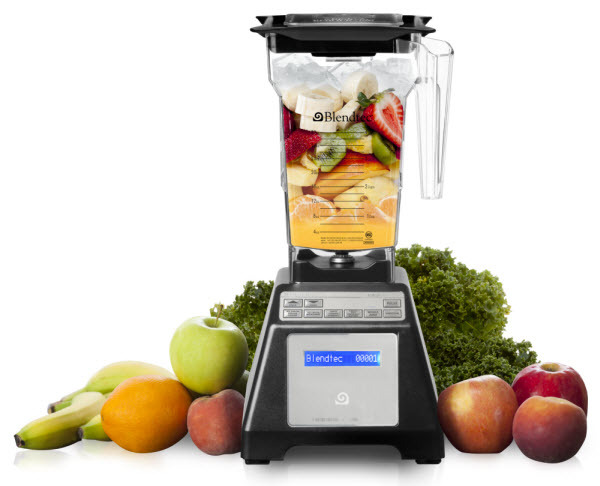 This blends the ingredients on a medium to medium-low speed for 30 seconds. And it’s done… smooth, thick yummy baba ganoush. So far I have eating this with some fresh, crunchy raw carrots and radishes that I purchased from the vegetable sellers outside Saagar’s (Osu) (map). It is also a great accompaniment for the cabbage, kidney bean and quinoa vegetarian/vegan burgers, I made for a previous post.